Sake Brewery Tours in Japan: Feb & March 2011! Have you ever wanted to tour Japan and visit the places where sake is made? I just heard about an amazing opportunity to do just that!! Sake-World expert John Gaunter and TokyoFoodCast dynamo Etsuko Nakamura are undertaking something I had always wished existed – Sake Brewery Tours! Travelers receive 10,000 JPY discount for booking before the 1st of December by using the promotional code “URBSA“. Space is extremely limited so make your booking today! https://www.urbansake.com/wp-content/uploads/2016/04/janome-logov6.png 0 0 Timothy Sullivan https://www.urbansake.com/wp-content/uploads/2016/04/janome-logov6.png Timothy Sullivan2010-08-15 14:09:262010-09-04 22:15:32Sake Brewery Tours in Japan: Feb & March 2011! I saw this great news tidbit on Kyodo News and found this fantastic! I wonder if sake has been served in the White House yet? prolly has! I’m especially excited as this story features Koichi Saura from Sake Samurai and Urakasumi fame! Yea Saura-san! John and Etsuko have two sake brewery tours set up for early 2010. I’m telling you – these are not to be missed and they couldn’t be lead by more knowledgeable or nicer people. It’s a rare opportunity to peek inside the closed world of the Sake Brewer and see the delicious day to day live of making the world’s best beverage. You will arrive at Karasuma Kyoto Hotel by individually arranged transportation. The day begins with a half-day lecture by John Gauntner to prepare you for our brewery visits. The collection of brewing tools and bottles spanning all eras of the industry at the Gekkeikan Sake Museum deepens your knowledge. We make our first brewery visit in the scenic and historic Fushimi Ward of Kyoto City, an area that continues to prosper as one of the two brewing capitals in Japan and as the home to more than twenty breweries. You may choose to spend the day leisurely exploring Kyoto on your own, or make an optional visit to Tenryuji Zen Monastery in Arashiyama. After wandering among the deep, tranquil bamboo groves, enjoy the stunning view from the impeccably manicured Japanese garden at the private estate of the late silent movie star, ÅŒkÅchi SansÅ. Then, we visit Matsuo Taisha, dedicated to the god of sake brewing, which is worshiped and visited by almost every brewer in the nation. A visit to the serene moss garden at SaihÅ-ji, also known as the Moss Temple, will leave you with peaceful memories of the ancient capital. In the morning, we will visit another brewery in Kobe, the largest brewing center in the country, and continue to Osaka for a castle visit. The final kura tour and dinner at an historic brewery will leave everyone with beautiful memories. On the last day in Kyoto, the morning begins with a walk down the passageways of one of Kyoto’s main fish and vegetable markets, Nishiki Market. There is a wide selection of pickles, specialty local vegetables (Kyo-yasai), bean curd, and traditional Japanese cooking tools to delight any foodie. After an early lunch at the market, a visit to Nijo Castle is the feast for the eyes with sumptuous artwork from the Edo period at the Shogun’s residence and the strolling garden designed by Kobori Enshu. You will arrive at Yonago Airport or JR Yonago station in Tottori individually and transfer to the Hotel. A half-day lecture by John Gauntner prepares you for our journey. In Sakaiminato, enjoy the first brewery tour and tasting right in the heart of very popular Mizuki Shigeru Road where statues of spooky yet very comical characters welcome visitors. Then, stroll in the beautiful Japanese gardens of the Adachi Museum of Art and enjoy their collection of Japanese paintings by renowned artists, most notably, Yokoyama Taikan. Private car takes you to Matsue. This beautiful city surrounded by water is often called â€œ the Venice of Japan â€. Start the day by visiting a sake brewery. From the brewery, explore the beautiful historical city on foot and on by small boat through the canals surrounding the castle. Savory banquet-style dinner served with local sake at a Japanese-style inn. In the morning, visit one more sake brewery. Then, wander the Izumo Grand Shrine, one of Japan’s most ancient and important shrines. A visit to the Shimane Museum of Ancient Izumo to browse through the stunning collection of historical discoveries gives you insights into the pre-historic myth, religion, and history of this old crossroads. In the evening, stay at the quaint, tiny coastal onsen town of Yunotsu and enjoy a quiet, relaxing evening. Banquet style dinner and sake are served at the ryokan. Explore the town of Yunotsu on foot and tramp along a rocky coastal beach or visit a pottery studio where you can see a traditional kiln. Then, visit the most recent World Heritage Site in Japan, Iwami Ginzan Silver Mine, where you explore the old mining town accessible only on foot. A leisurely stroll along the winding creek with blooming spring flowers and the sound of birds creates a timeless moment. A private car takes you to JR Hiroshima Station, where you can continue your travels or head back to Tokyo or Kansai. Participants will continue with any onward travel plans. Note that Michi Travel can make arrangements for you. https://www.urbansake.com/wp-content/uploads/2016/04/janome-logov6.png 0 0 Timothy Sullivan https://www.urbansake.com/wp-content/uploads/2016/04/janome-logov6.png Timothy Sullivan2009-10-18 09:58:062009-10-18 09:58:06New: Sake Brewery Tours! Urban Sake In the Press! I’ve been lucky enough to get a few mentions in the press and on other blogs of late. I even got interviewed! And you know it’s really me…. who else would match Sake and Turkey Burgers. sheesh! Take a looksee the links below to see where Urban Sake has been popping up! Chopsticks asked for my comments on one of my favorite topics… Dassai 23! See the “Voice from Dassai 23 Enthusiast” sidebar on this full page spread. Japan Up! Magazine asked me to do a full page interview. It’s called a “Special Interview with a BIG sake lover!”. Here I admit, in print, to my Sake and Turkey Burger fetish. The New York Times Dining Section Calendar featured a blurb on my Sake Class at Astor Center. It is a thrill to see your name in the Times and a relief it’s not in the obituary column or police blotter. Kanpai to that. Blog by Blog Guide to… Tokyo. Ok, ok, I know that my blog is not directly related to Tokyo, per se, but the folks at the Guardian were kind enough to include my blog in the sake section! The Golden Masu Awards are gaining traction! Move over Oscar! Being included in the Thrillist was indeed a thrill for me, if not for others. They took note of my Urban Sake Google Map to New York City. I’m happy that they found this map to be useful and I hope to expand the maps more and more as time allows. https://www.urbansake.com/wp-content/uploads/2016/04/janome-logov6.png 0 0 Timothy Sullivan https://www.urbansake.com/wp-content/uploads/2016/04/janome-logov6.png Timothy Sullivan2008-01-18 00:02:542008-01-24 03:04:47Urban Sake In the Press! Hear Ye, Hear Ye! Sakaya is Now Open! In Japanese “sakaya” means sake shop, so this seems the perfect name for a stateside temple to Nihon-shu. This beautiful store is the brainchild of sake-loving couple Hiroko Furukawa and Rick Smith. Hiroko and Rick envisioned a boutique space where sake aficionados could find the best the sake world has to offer and expand their palates as well. Sakaya is a special place indeed, both inside and out. The interior design of this boutique was crafted by the same talented Japanese architect that designed Momofuku and Kyotofu. It’s beautiful, simple and elegant. The owners even found the perfect window dressing, a beautiful life size Sugidama imported from Japan. 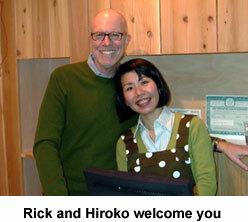 Rick and Hiroko are starting out with about 80 hand selected sakes and will ramp up to sell more brands in the future. Sakes range in size from 300ml to the large 1.8L ishobin size. Some of the brews are even available for “try before you buy” sampling – a rarity in New York. In addition, they are offering a small selection of sake serving sets, sake books and shochu. BTW… Sake makes the perfect holiday gift… um, especially for me. All this really is great news for the New York City Sake community. It’s enough to make me want to grab a bell an shout from the roof tops. https://www.urbansake.com/wp-content/uploads/2016/04/janome-logov6.png 0 0 Timothy Sullivan https://www.urbansake.com/wp-content/uploads/2016/04/janome-logov6.png Timothy Sullivan2007-12-08 12:25:462007-12-12 02:11:39Hear Ye, Hear Ye! Sakaya is Now Open! Scott took me out for a special dinner and we went to perhaps the most well known sushi restaurant in New York: Sushi Yasuda. Because it’s such a famous temple to the art of sushi, it’s been on my “must try” list for a long time. What amazing Sushi and Sake combinations await me here!? Such a famous place must have a top notch sake list to pair with all that sushi. I was very excited. However… things didn’t go quite as planned on the sake front. Let me start off by saying the sushi was delicious. If anything threw a monkey wrench in my experience at Yasuda, it certainly was not the presentation, quailty or taste of the fish. My first order of business at any Japanese restaurant is to look at the sake menu. To my surprise, I only found 5 or 6 sakes offered cold. huh? …and of those sakes, there were some solid, upstanding choices, but nothing out of the ordinary. What’s going on here? I was looking at Ichinokura, Otokoyama and even domestic Ozeki. Does not compute! Most of the top tier Japanese restaurants I’ve been to pride themselves on an extensive sake list. Most even have a sake sommelier on staff. At Yasuda, of the few choices I had, I decided to go with the one I knew the least and hope for the best. I ordered myself a serving of the Takenotsuyu Junmai (Yamagata, SMV: +2 , ALC: 14.5%). The Takenotsuyu was served in a beautiful ceramic carafe and I took a sip… Then it hit me like a ton of bricks! finally, it all made sense. This Junmai was mild and unobtrusive, light and drinkable. Yasuda is about the fish, the whole fish and nothing but the fish. The thinking must be that any flashy sakes would upstage or overwhelm the fish. I guess this is kind of along the lines of “never wear white to a wedding” lest you upstage the bride on her special day. Well, this is Yasuda’s place, so I decided to chill out and let him offer the sakes he thinks thinks place his fish in the best light. The Takenotsuyu was so mild, it worked like a tasty palate cleanser between bites of buttery fish, but really put the fish in the foreground, sake in the background. The atmosphere at Yasuda was minimalist and quiet. I quickly got the sense that this was a high profile “special occasion” destination restaurant. The clientele seemed less die-hard New York City foodie and more well-to-do tourist or Birthday/Anniversary Couple. Consequently, the service seemed geared for the uninitiated sushi goer. Despite this, and all my other quibbles about the sake list, the experience was authentic and delicious. In the final analysis, however, given the lack of Sake options at Yasuda, I won’t be chomping at the bit to go back anytime soon. But no worries – there is always a line out the door of folks wanting fish and sake just the way Sushi Yasuda is serving it. October 1 is International Sake Day a.k.a. “Sake No Hi”. Even I will admit Sake Day is not yet as well known as other Hallmark-type holidays such as Valentines Day or Groundhog Day… but I have a dream, people! One day, Sake No Hi will rank up there with the other holidays of note or, at the very least, be more popular that Arbor Day. Wouldn’t it be great if Sake Day packed every sake bar in town just like St. Patrick’s Day packs the Irish pubs with green beer drinkers on March 17th? Well, until that day arrives, I have the Mutual Trading Japanese Food and Restaurant show to fall back on. This show is a fantastic event open to the trade that showcases japanese food, restaurant supplies and first and foremost (in my mind) sake. Mutual Trading is a big company and they import some top drawer brands. There were about 15 booths to explore and here are some of the highlights. My first stop was at the Tamanohikari booth. There I met Mr. Ujita, Tamanohikari President and Mr. Mabuchi, Export General Manager. I’ve had tamanohikari on many occasions and I really enjoy their well regarded daigino. However, something else at their booth caught my attention. It was a sake soft pack – not unlike the juicy-juice pack your mom packed in your school lunch. I’ve never seen anything quite like it up close and in person. Not only would this be great on picnics or in places where glass bottles are not permitted, this pack comes with instructions on making “sake slushies”. According to the directions, just pop this puppy in the freezer for a few hours, pour out and enjoy! Continuing on the unique packaging theme, my next stop was the Kikusui booth. This is another well regarded brand and they offer one of the best known sakes in a can this side of the pacific. Kikusui in a can is strong stuff – a genshu. But in my opinion, you can’t beat the fun of popping open that can… and truth be told, it really does keep the contents totally shielded from one of sakes big enemies, Light! They also had a unique aged sake or Koshu, also offered in can. In addition, they were offering samples of Kikusui Junmai Ginjo which is a terrific sake with a milder, yet engaging flavor profile. My next stop was at the Asamai Brewery booth, makers of Amanoto, another well respected brand over here. I met Mr. Kakizaki, President of Asamai Brewery and he enthusiastically introduced me to the latest and greatest Amanoto had to offer. I sampled their terrific Honjozo (seimaibuai: 60%, SMV: +4, Alc: 15.5% ). It was bold with lots of backbone and a pleasant touch of rice in the nose. I was also lucky enough to taste a the terrific Amanoto Daiginjo (Seimaibuai: 38%, SMV: +2, ALC: 16.5%). This sake went above and beyond and really seemed to melt in your mouth. Check them out if you get the chance. The Mutual Trading Sake day event also had me tasting tremendous sake from other brewers, too. I had Dassai, Nanbubijin, Muromachi and Born to name a few. Tasting these superior sakes had me convinced once and for all – Hallmark had better make room on their shelves for those “Happy Sake Day” greeting cards. My first message from Melinda, the mastermind behind Tokyo through the Drinking Glass Blog, arrived in early July 2006. After a few messages back and forth it became clear that we were kindred sake otaku and so began our (online, 21st-century, cyber blogging) fast friendship. Together with Melinda, we not only chatted back and forth but we also organized cyber sake tastings to help connect all the sake-interested bloggers in all parts of the world. Ms. “Drinking Glass” also did me the great honor of introducing me to her sake friends Rick and Hiroko here in New York who have now become dear friends of mine, too! When word hit the sake underground that Melinda was headed to the US for a visit, I could hardly believe it. We were going to meet, as the kids text these days, “F2F”! Rick and Hiroko arranged a wonderful night out to welcome Melinda to NYC and were kind enough to invite me along. This gave us all a wonderful evening to laugh and have a great time. Needless to say, it was a blast to meet Melinda F2F and catch up after all these months of emailing. Our mutual passion for all things sake really makes us Sake Wonder Twins! Just Like Zan and Jayna! Ok, Melinda – can’t wait to see you again soon… and drink some urban sake on your home turf next time. https://www.urbansake.com/wp-content/uploads/2016/04/janome-logov6.png 0 0 Timothy Sullivan https://www.urbansake.com/wp-content/uploads/2016/04/janome-logov6.png Timothy Sullivan2007-09-27 19:02:252007-10-08 20:59:00Sake Twin Powers... Activate! New York is crowded and hot. Yuck! what better reason to head out of the city and do a little “sake research”? Zip across NJ and before you know it, you’re in Philadelphia, the City of Brotherly Love. I wanted to see how much sake lovin’ was going on in the city that bore witness to such world-changing events as the signing of the Declaration of Independence, the drafting of the US Constitution and the invention of the Cheese Steak Sandwich. Our first stop on the road to Sakedelphia was perhaps the most well known Japanese restaurant in all of Pennsylvania, Morimoto. Masaharu Morimoto is best known as one of the Iron Chefs in both the US and Japanese versions of the program. He started his signature restaurant in Philly and later opened a New York Branch of Morimoto. I haven’t been to Morimoto New York, but the Philly branch rubbed me a bit the wrong way from the get-go. To start off with our waiter asked us if we liked both sushi and SHIshimi. (pet peeve alert! Jeez! I may not be fluent in Japanese yet, but even I know it’s SA-shi-mi.) In addition, everything in the restaurant is rigidly fixed in place…the tables and chairs are secured to the floor, the light on each table is bolted down. This signaled to me that you need to fit into this space, not the other way around. No disturbing the design or geometric layout, please. This inflexibility unfortunately extended to the sake menu. For the serious sakes on the menu there was only sake from one brewery, Fukumitsuya. and they offered one Morimoto Brand Junmai, one Ginjo and one Daiginjo. In the name of sake research, I went for the $30 tasting flight which gave me a two ounce vial of each. The Fukumitsuya was mostly good, but nothing special. Each grade I tried was a fair representative of it’s class… the Junmai was hearty, the ginjo a bit more mellow and open (however, I also found it the most unbalanced of the three) and the Dainginjo more floral and delicate. The limited and restrictive Morimoto sake menu reminded me of my Matt Damon dominated birthday dinner at Nobu, (p.s. Chef Morimoto was executive chef at Nobu for a few years.) also a restaurant that restricts it’s sake to one ‘branded’ Brewery. What’s up with this anyway? Are the chefs so wedded to having a Nobu or Morimoto branded sake? or are they “helping” their customers by only offering one simple sake option? Reminds me of that time I went shopping in an East German supermarket… one brand of coffee, cola or milk for sale – take it or leave it. In the final analysis, Morimoto wasn’t bad – actually the SHIshimi was the best part of the meal – but for the cost and all the hoopla, I was hoping for something a little more special. After dinner, we walked around historic Old City. Just after we bumped into Ben Franklin, (for real!) we happened upon another japanese restaurant – Haru. Now, this restaurant launched from New York to Philadelphia – just the reverse of Morimoto. I peeked at the menu which looked good and checked out their tiny sake listing. Sakes offered by the glass included sho chiku bai junmai (US made), Yaegaki junmai (US made), Kaori Ginjo, Yamadanishiki Ginjo and a Zuicho Daiginjo . Scott and I didn’t get a chance to eat here, but the staff seemed friendly however, the small and somewhat US-made sake list didn’t warrant a return. On our second night out on the search for sake, we turned to Zagat for some insight into japanese cuisine in Philadelphia. Shiroi Hana was comparatively highly rated by philadelphians so, going by Zagat alone, we picked that as our next dinner spot. Wat a mistake! This wasn’t a Japanese run sushi establishment and the utter disregard for sake of any importance on the menu disappointed. The menu offered “hot” sake and “cold” sake and a gekkikan daiginjo by the bottle. ouch! I actually went with the Diet Coke in protest. The food was so-so and the lack of any interesting premium sake made me weep silently. E tu Zagat? Our last night was winding to a close and so far Philly was getting pretty low marks for sake friendliness. On our way back to the hotel from Shiroi Hana, we were going to pass one more restaurant called Fuji Mountain that supposedly had sake on the menu. We decided to stop in for dessert and some sake to check it out. Dassai Junmai Ginjo, Matushima Junmai, Kikusui Junmai Ginjo, Karakuchi Honjozo, Tokeseu Gold Daiginjo, Dassai Nigori. Yum, some good stuff! I ordered one of my favorites, the Hakkaisan Ginjo (Hakkaisan Brewery Co., Niigata Prefecture, SMV +5, Acidity 1.0, ALC 15.5%). It was delicious – smooth and round in flavor. most drinkable! And if that wasn’t enough, Fuji Mountain also has a full-on Sake lounge upstairs and a separate Karaoke room to rent. I think the efforts of the guys at Fuji Mountain are a great first step on the road to full blown sake revolution in Philly. Now that’s a fight i’ll sign on for! My sake friend Nell works at an amazing robata grill restaurant on the east side called Aburiya Kinnosuke (213 East 45th, 212-867-5454). After many promises to visit, I was overdue to give Nell’s workplace a try. Once I found out Aburiya was owned by the same folks that run Torys and Yakitori Totto – two of my favorite restaurants – it was on! Suffice to say, this place is off the hook! In Japanese, Robata means “by the fireside,” and refers to the centuries-old country style cooking of northern Japanese fishermen.Evenings in coastal villages found fishermen cooking their catch over an open fire, then sharing among themselves by passing food on oars from boat to boat. When Scott and I arrived, Nell seated us at the bar and the first thing I felt was a wave of heat from the robata grill. It was the best seat in the house! Scott and I watch in amazement as the chefs tended the fire and kept perfect tabs on every piece of food propped up and slowly grilling around it. Everything we had to eat was grilled to perfection and so delicious. It takes longer than direct heat cooking but it’s worth it. The next great treat that awaited me at Aburiya was the sake menu. This was a menu with personality. It wasn’t the same usual 10 sakes you see at every regular Japanese restaurant in town. These were unique! Unusual! Intriguing! After much debate, I ordered the Houraisen Wa (Sekiya Jozo Brewery, Aichi Prefecture, Seimaibuai 55%, ALC 15.8%, SMV -5, Acidity 1.5) This was the winner for sure. It was slightly sweet with light acidity. A bit delicate but oh soooo smooth. really enjoyable, soft and drinkable. This sake is a Daiginjo in ginjo’s clothing. This sake was also served in a fancy blue cut glass tokkuri. I will order this one again. Scott tried a small carafe of the Kikuhime Yamahai Junmai (Kikuhime Brewery, Ishikawa Prefecture, SMV +2, Acidity 2.0, Seimaibuai 60%). This Yamahai didn’t really ring my bells. It was kind of an over-the-top yamahai style. To me the flavor was unbalanced and too earthy. Note the super high acidity. I think that may be what tastes out of wack here. It wasn’t awful, but paired up side by side with the Houraisen Wa, Kikuhime didn’t stand a chance. I don’t think this flavor profile will appeal to a broad range of sake drinkers out there. If you get a chance, do not pass up an opportunity to try Abuiya Kinnosuke. I can’t say enough about how much we enjoyed our meal and sake.The atmosphere is wonderful, too and you can’t help but feel that you’re on a mini vacation to Japan. The open hearth style of cooking is a natural fit for winter weather. As the temperature outside starts to drop, I know I’ll be back to warm up with some toasty Robata and then Chill out with some cool sake. It’s that unique sake list that makes this place one of the best — even without a grilling robot and conveyor belt. Special thanks to Nell for all the hospitality and turning us on to such a great restaurant! Domo Arigato! The internet is quite a treasure trove. So much information right at your fingertips. Every once in a while, however, you stumble upon something that is, well, just plain special. When pouring sake into other people’s cups, hold the sake bottle in the middle of the body and try to use only one hand to pour. Some people use both hands to serve sake in an attempt to show respect. The correct way however, is to pour with one hand. *: For women, however, it looks more elegant to touch the left hand to the bottle when pouring sake into people’s cups. When pouring from a bottle without a pouring lip, make sure the pattern or design on the bottle is on top and visible. Look into or shake the bottle â€¢â€¢â€¢ It is considered very bad manners in order to check if there is any sake left.Correct way â€¢â€¢â€¢ Just give the bottle a light shake. When drinking sake, pick up the cup, bring it toward you, pause slightly then moving the cup up parallel to your chest, bring it to your mouth and drink. IKKINOMI â€¢â€¢â€¢ Emptying the cup in one gulp is both bad manners and bad for your health. Make sure to hold the cup when you are served sake; the same goes for when serving sake to other people.OKITSUGI â€¢â€¢â€¢ To pour sake into a cup set on the table, or to accept sake with your cup set on the table is bad manner. receiving Sake If a sake cup is preferred by an older person to a younger person, the cup must be accepted with both hands, and the words “CHODAI-SHIMASU” should be said in thanks. When you would like a superior or someone older to offer their sake cup, say “ONAGARE-O-ITADAKIMASU”, and use both hands to receive the cup. Never hold your own cup out to a superior or someone older for it to be refilled. If there isn’t, he should align his hands when returning the cup and say “ARIGATO-GOZAIMASU” or “thank you very much”. Using just one hand is also acceptable. When a person who accepts a cup of sake from a superior or someone older returns the cup, he should first clean the cup if there’s a washbowl nearby. Note to self: avoid formal banquets if possible. Well, I always thought if I simply avoided serving sake in disposable cups, I’d be able to sidestep any sake faux pas, but obviously, there is a lot to learn about “sake party manners”! p.s. Check out this site if you want to spread your own bit of Gospel. https://www.urbansake.com/wp-content/uploads/2016/04/janome-logov6.png 0 0 Timothy Sullivan https://www.urbansake.com/wp-content/uploads/2016/04/janome-logov6.png Timothy Sullivan2006-09-01 21:51:332006-09-02 16:03:36Sake Gets Some Converts! I go on and on all the time about how lucky I am to live in new york… and how amazing all the NYC sake bars are… and how the Liquor stores in the Big Apple have such a great selection of sake… and did I mention how lucky I am to live in New York? However, as Pee-Wee Herman once said, everyone’s got a big “BUT”. In my case, New York is great, BUT the one thing we don’t have? True Sake, of course. For those Sake fans among you who are infrequent travelers like myself, you may not be aware of True Sake in San Francisco. Well, let me spread the good word! This well designed shop is America’s first store dedicated exclusively to selling sake. The store is owned by Beau Timken, one of the premier sake Gurus in the States. He’s a passionate advocate for Sake appreciation and obviously works hard at helping educate consumers in the U.S. to the sheer joy of Nihon-shu. Right ON!! Now, I’ve never been to True Sake, but it would, of course, be a “must see” destination on my next trip to San Francisco. In the meantime, I really enjoy getting True Sake’s monthly Newsletter. You can sign up for the newsletter on the True Sake website. As a self professed sake geek, I look forward to mine every month. It’s well written and really informative. As a matter of fact, I’m now an active “bottle sniffer” as a result of reading the newsletter! He introduces new sake imports, does interviews with sake personalities and answers reader’s questions. Mr. Timken has also written a book, the recently published “Sake, A Modern Guide“. I highly recommend it as a great addition to the handful of books available in English on the topic of sake. It offers a great overview of Nihon-shu, up to and including sak-tails. For those that think Sake Cocktails are controversial, I hope this is an eye opener. Sake is meant to be enjoyed and appreciated and enjoyed some more. From all I’ve read, that seems to be the main message of the book and from this Sake oasis in San Francisco: try some sake and then try some more. find out for yourself what you like and don’t like. Drink the brands and style that taste best to you. It’s all about finding what works for you and enjoying it. So True! Boy, I was in a bind! Now that I’m known as the “Sake-Guy” among my friends, It always falls to me to pick the location and the drink when we decide to go out for a little nihon-shu sipping. My College buddy Brad and I were long overdue for drinks and we wanted to catch up with eachother over some sake somewhere downtown on the west side since i’m in chelsea and he’s in the West Village.I ran through my usual list of sake hangouts and found they were heavily weighted to the east side of manhattan… Sakagura, Decibel, Satsko, Chibi’s, Sachiko’s on Clinton… what’s wrong with the west side? !, I thought. My mind scrambled to think of a place and “Sake-Guy” was coming up empty! What kind of “Sake-Guy” can’t think of a west side hangout, anyway?! Then it hit me – I remembered Paul Tanguay of the Amazing Of Rice and Zen blog had recently Posted about UrbanSake.com. He is Beverage Director and Sake Sommelier at Sushi-Samba. That’s it! Drinks at Sushi-Samba in the West Village. Done Deal.When Brad and I arrived, we found the restaurant hopping but lots of space in the sunken cocktail lounge. Our friendly waitress brought over the very extensive Sake list. So many wonderful things to choose from – you could just tell this list was crafted with the utmost care and know-how. awesome. You can check out the sake list on-line. well, now the pressure was on to pick the sake. Brad said he enjoyed things a touch on the dry side, and we were in the mood to kill a whole bottle,so that’s what I had to work with. I was just wanting to pick something good. I did my best, followed my gut and went with the Sawanoi. Our waitress said she hadn’t personally tasted it, but we forged ahead anyway. The sake was served in unique little glasses that looked kind of like miniture wine glasses. Our Waitress poured and we tasted. I’ve learned over time, and this was proven here again, that a sake really will ‘open up’ after it’s, well, opened up. The bottle was chilled and I was unsure of the taste durning our first few sips. After a few mins of gabbing and relaxing, the sake in the glass warmed just a touch closer to room temperature, and while still slightly chilled, the taste began to expand and mellow and offer that hint of dryness we were after.Brad was impressed and asked me to repeat the name of the sake we were enjoying. “Sa-wa-noi” I said. He was searching for some hook to help him remember the name for his next trip. “Sa-wa-noi… Sa-wa-noi…” then he had it! Sounds like “So-An-noy-ing!” um. well, yeah. it kinda does! Our server brought us over a wine bucket for our sake – Fancy. It was this big, free standing, shining metal bucket… a far cry from the dinky ice bucket you usually get on your table. Made me feel a little bit like I was at the stork club, or 21…. well, except for the people around us screaming about the world cup as events unfolded on widescreen tvs above our head.After a few more glassfuls and a few edamame, we found ourselves staring at the bottom of our Sawanoi bottle. empty! Well, in the end, this Ginjo really was delicious. It has some presence and complexity and was definitely not a watery-wallflower. After such a fun evening, and finding a good location and good sake, I really felt more like a real “Sake-Guy” than before. My Sake-Guy recommendation? when in the West Village, stop by Sushi-Samba for your sake pitstop.And don’t forget… to impress friends and family with your Sake know-how, be sure to ask for that “So-An-noy-ing!” sake. UrbanSake.com hits the road! This past weekend Scott and I took a weekend trip to Boston to visit with my sister Maddie. This was the perfect opportunity to see what was happening in Beantown in regards to all things sake. So, here’s part I of what I saw on my little peek into the Boston underground sake scene…. a sake retailer. Word on the street was that “Mall Discount Liquors & Wines” (202 Alewife Brook Pkwy Cambridge, MA 02138 (617) 864-7171 ) had a big sake selection for Boston standards, so off we went! From the outside, ‘Mall Discount’ lived up to it’s name. Strip mall? check. Discounted Condition? check. Once inside, Mall Discount turned more into “Cave Discount”. The place was dark and a little cavernous with endless racks of wine and booze crammed close together into the large space. I had to wander around for a little while before Vic spotted the sake shelf. I have to say I was surprised with the number of sakes for sake. they did have an above average collection! The offering was better than many run of the mill liquor stores in NYC. Upon closer inspection I quickly noticed that quite a few of the sakes were either American made brands or Ozeki. To their credit, they did have many imported sakes. I picked up three sakes I had never had tried… Tozai “well of wisdom”,Hakushika “fresh and light” and Hakutsuru. When I was checking out, the clerk seemed amused to see me buying only sake. She took one look at the Hakutsuru bottle with the super cute sake-as-lid design and said admiringly “those Japanese are so Smaaart.” She also told me there was an amazing sake they sold for only $6.99 – it was the one in the green bottle. Well, There were a lot of green bottles in the sake aisle, so I just had to leave the follow up on exactly what she meant for another trip to Boston. All in all Mall discount was an OK ersatz for new York supply. Let’s put it this way – better than I expected! My only concern would be freshness. None of the sake was refrigerated and a few bottles had sake tinged yellower than I’d like. However, freshness was not a concern with the one Boston sake that I’ve tried so far, the Tozai. I bought this one particularly because I saw the bottling date was Nov 05. nice! This sake didn’t disappoint. I found the taste to be pleasant and chewy without losing it’s refinement. The texture of this sake cries out for some food as an accompaniment. Sipping the sake on it’s own left me wanting for something to nibble on. You know, a salt for it’s pepper, a yin for it’s yang… If you’re planning a hearty meal with friends, I’d recommend this sake for the table. It’s uncomplicated and solid. cellar! They also have a great selection of chilled 300ML bottles which are excellent for sampling the more expensive sakes before you commit to a $50 bottle. Someday I will have worked my way thru tasting all these sakes but until then I can only stare, wishing I had a million dollars to buy them all. Mitsuwa is more than just Sake. It’s fun to just walk around and explore. Kinda like a really cheap trip to Japan! There is a food court, a crazy selection of Japanese candy… actually a crazy selection of Japanese EVERYTHING. Too many wonderful-crazy Japanese objects to list, but my hands down favorite discovery on this trip was Kewpie Mayonnaise. this was the weirdest – looked like a regular bottle, but when you touched it, it felt squishy like a breast implant! get your hands on a bottle if you don’t believe me! If Edgewater sounds like a galaxy far, far away, it kinda is to us city folk. Luckily, but just like Ikea, Mitsuwa has a bus ($2 each way) that will take you right to Mitsuwa from Port Authority. can’t argue with that. If someone else does the driving that frees you up to really enjoy some sake over a yummy, adventurous lunch. So, I say, transport over to Port authority, gate 51. Tell the driver to lay in a course for the the Mitsuwa-mothership at warp 8. sit back and relax, you’ll be home soon. Engage! https://www.urbansake.com/wp-content/uploads/2016/04/janome-logov6.png 0 0 Timothy Sullivan https://www.urbansake.com/wp-content/uploads/2016/04/janome-logov6.png Timothy Sullivan2006-01-22 23:30:032006-01-27 20:08:29Beam me up, Sake! well I kinda know the answer… sakÃ© WITH the Ã¡ccÃ©nt is the way that that the real studs who literally ‘wrote the book’ on Sake do it. but i’m going to type the word S-A-K-E….Ã‰ alot! not to mention the embarressment of keeping a blog for two months spelling the object of my affection’s name wrong.